Article: Berryhill AFP = Dirt Tough! The command was given, "From the standing position in tactical mode, drop to the prone position and accurately place one round on the target in three seconds. Then stay in the position until told to do otherwise." The instructor walked down the line and tapped each student on the shoulder, which was the cue to move. My turn came. As I dropped down to the prone position, the safety came off my M4, my eye caught sight of the target 50 yards away through my CompM3 red dot sight, and I placed my shot on the X in 2.44 seconds. After each student had placed his shot, the instructor directed us to place some shots from the roll-over prone position to the right, which would press my holster and pistol into the soft, almost powder-like dirt. Over I went, and put five rounds into the X. Then over to the left we went. Back and forth five times until we could drop from the standing position and accurately place one round from the roll over prone position, left or right in four seconds or less. Needless to say, my holster and the Berryhill AFP pistol I was packing that day became containers for that soft, powdery dirt. I could already picture in my mind the cleaning time that lay before me. I was snapped out of that thought in no time, as after the roll-over prone drills we were immediately called to perform transition drills. We set up the rifle to allow for one shot, then switched to the pistol. This was all done without having to look over our equipment, especially after our pistols had gotten up close and personal with the dirt. With the first shot from the pistol came not only the usual puff of gunpowder smoke, but also an overwhelming cloud of dirt as well. Even though virtually every major part and machined crevice was filled with dirt, the AFP worked without hesitation. The first magazine saw more clouds of dirt than smoke, with the dirt clouds thinning out as I put four more magazines through the pistol. The sights were also dirt clouded, but I was able to finish that part of the class with all pistol shots maintaining a respectable group. Needless to say, not all pistols in the group functioned as well at that point. Dave Berryhill started out as a stockbroker right out of college, and then decided that the Law Enforcement world might better suit his occupational dreams. His career in the L.A. area covered 10 years, with specialty jobs as a department armorer/firearms instructor, as well as a member of the area SWAT team. After a back injury in the mid 90's, he turned to what he loved to do best: wrenchin’ on firearms. Although he attended NRA sponsored summer classes at Lassen College while he was still working in the LE world, after retirement he went full time earning a degree in gunsmithing at Yavapai College. He started out working on most everything under the sun, then turned to more of the mainstream self-defense firearms, those models from Glock, Sig, S&W, etc., before deciding to specialize on the 1911. He did a two-year stint as a firearms forensic specialist in Texas, but the call of the shop saw him return to doing what he loves best. 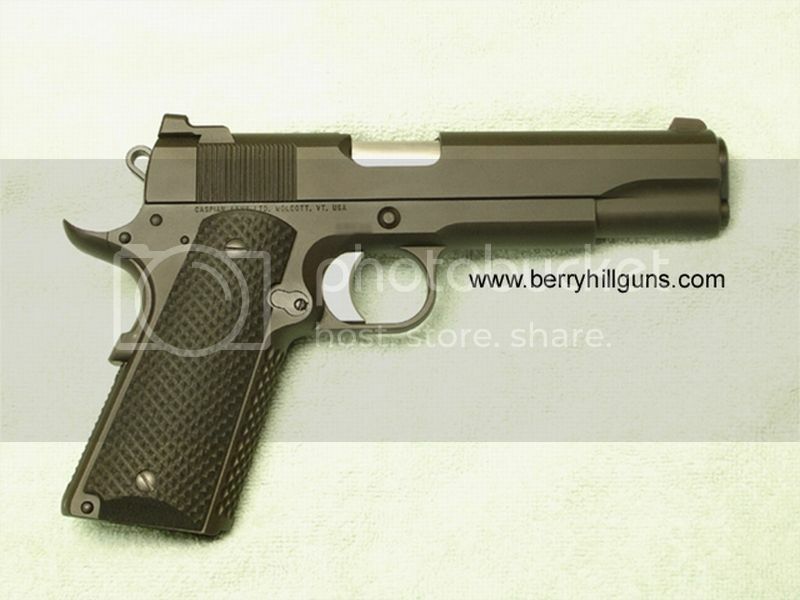 He will take in specialized customer requested work, but he loves to build the beloved 1911 from the ground up. Until recently, Dave was best known for his MEU(SOC) replica pistol. That model was so well done that it was hard to tell from the originals, and even the parts were serial numbered to each gun. But, as most things go, some good things have to come to an end. To match the quality and looks of the original, certain frames and slides had to be found, and some manufacturers just weren’t making what was needed. Some were found, but they weren’t up to Dave’s standards for quality. It was a hard decision to move on but, as they say, "Out with the old and in with the new." The AFP model has been offered for some time, but is now his main focus along with the BFP (Basic Fighting Pistol), and the "Traditional" model. 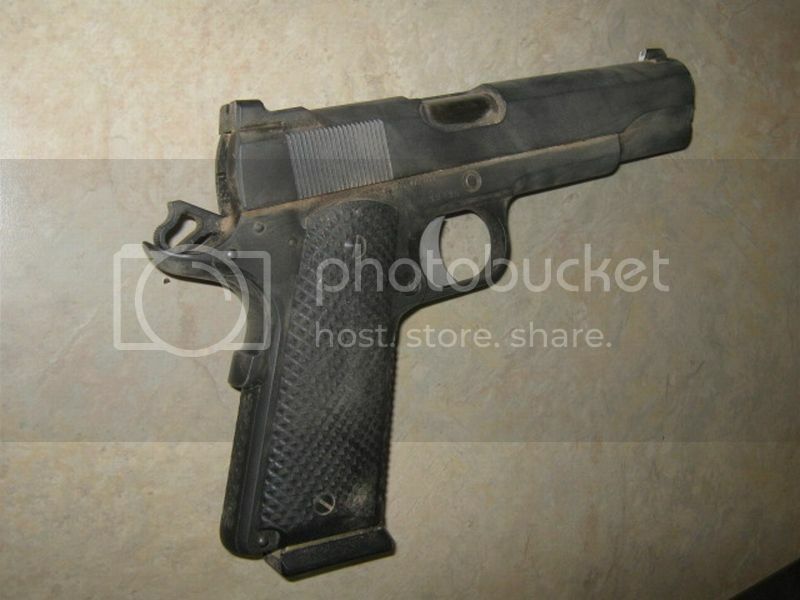 The BFP and Traditional models are a more classic-looking 1911, whereas the AFP takes on the world of top-class 1911s. It keeps a lot of the classic looks, but has all the features necessary to do the job if called upon. Dave starts with a forged frame and barstock slide, which are made to his specs. Add in a stainless steel, match grade barrel and bushing, and all small parts (hammer, sear, disconnect, slide stop, trigger, etc.) that are also made to his specs. A quick side note here: should you choose to fill your own gun with quality parts, Dave offers them for a very reasonable price. These are not run-of-the-mill parts, they are the same high quality parts used by other top notch ‘smiths in the biz. With a choice of finishes and sights (plain, gold bead, or night). Along with the combination of hand and machined complimented metal work, you end up with a pistol that’s very easy on the eyes but is combat fighting ready. Yes, this pistol started out extremely good looking before I got my hands on it … but looks don’t count for anything when your life is on the line. It has to fully function in every way, at any time, or the labor spent building it is all for naught. The AFP is a classic looking 1911, standard in size to the original blue prints, with modern upgrades to assure comfort, usefulness, and above all…reliability. 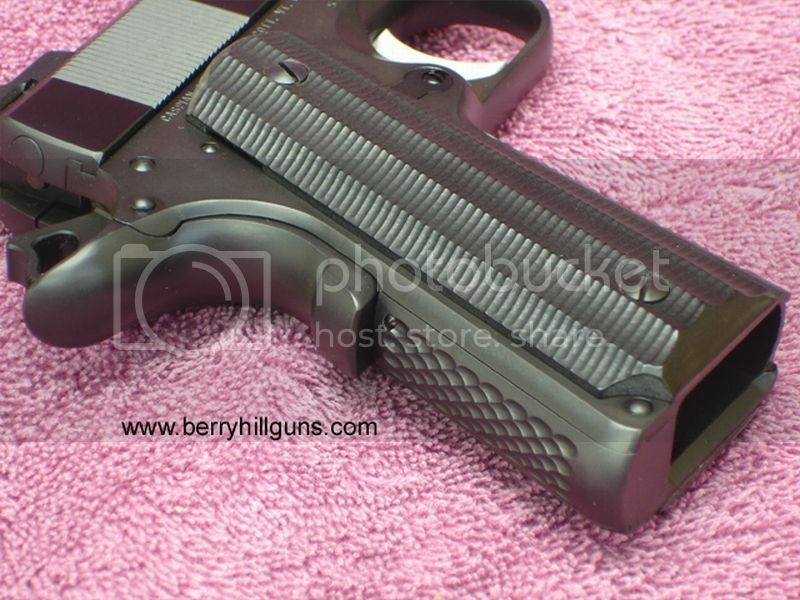 The take down is done with ease, thanks to the original style recoil system … no full length guide rod here, and all the edges have been taken off, but the classic 1911 lines have been left virtually untouched. The pistol that Dave sent to me is the very same model shown on the home page of his web site, extremely good looking, but all business. One production change is that the cocking serrations will be angled in the future. One of the first things you’ll notice, as I pointed out above, is the classic lines. Round-top slide, original cut at the dust cover, and the list goes on. Other than the recessed slide stop pin and the generous undercut where the trigger guard meets the frame, it's all pure 1911. 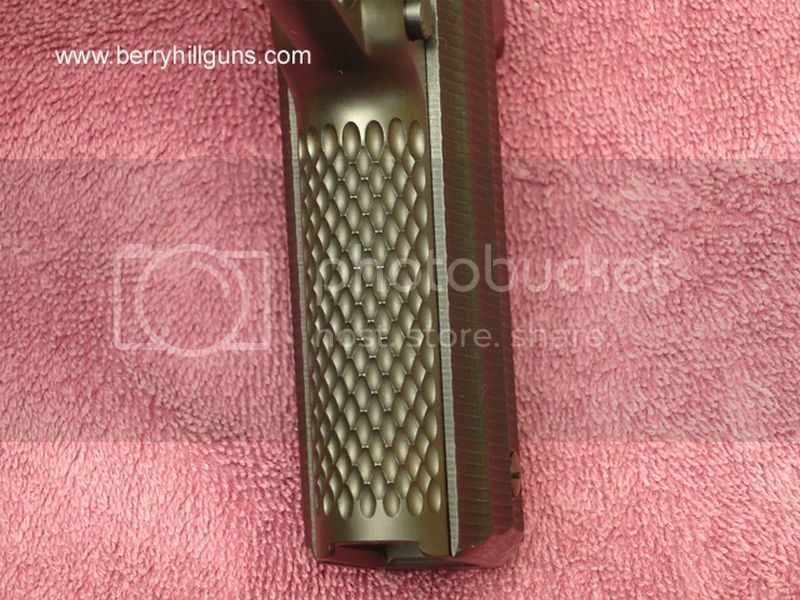 The finish on this particular gun is a salt bath black nitride, better known as melonite. After a day in the dirt, a few thousand rounds down range, being carried on the street for last few months, along with several hundred presentations from the holster, it's holding up very respectably. Those who know my writings know that I’ve never been fond of front strap treatments that have the names of fence types (chain link), reptile epidermis (snakeskin), or seafood (scallops), only because they tend to be more for looks than function. I tend to like something that will give the firing/primary grip hand a good purchase, yet won’t leave you running for bandages after a good day on the range. Dave convinced me to try his version of seafood, uh I mean scallops. Most scallops seen on guns will have the points between the scallops rounded or flattened, but not on the AFP. The points are left, but they are not sharp, and they work … a definite plus when the hands get wet or, as in my case, powder dirt covered. The mainspring housing is finely integrated into the frame, with nothing sharp to detract from the job at hand. Dave does offer an arched mainspring housing if desired, but because of the radius of the arch it makes machining the scallops nearly impossible, so checkering will be the option. The undercut at the trigger guard really helps with keeping the hand held high on the frame to facilitate recoil control. 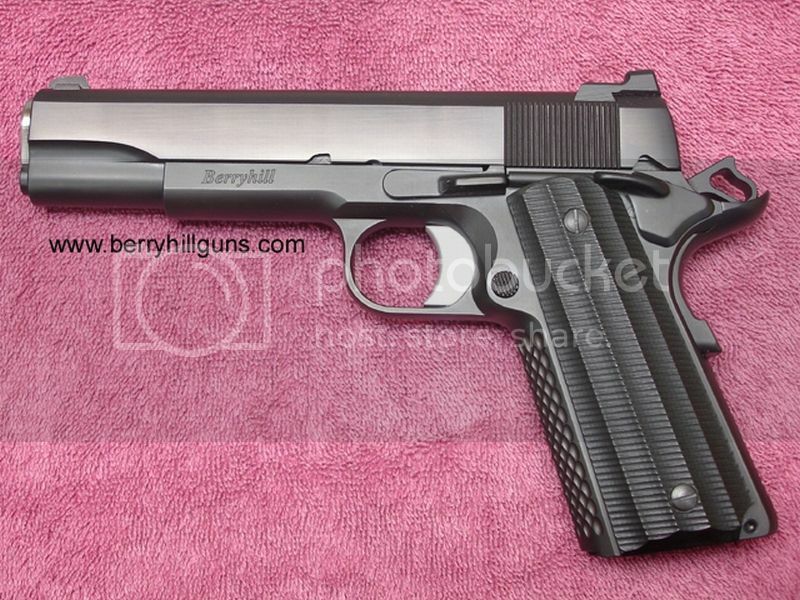 I have a feeling that this will soon become the standard on the 1911, for all but the most classic of models. You'll notice that this front sight is not blended into the slide, as this was a test front sight made by Kensight with tritium. The Kensight blade width is only .115, which is a little narrow for my tastes. 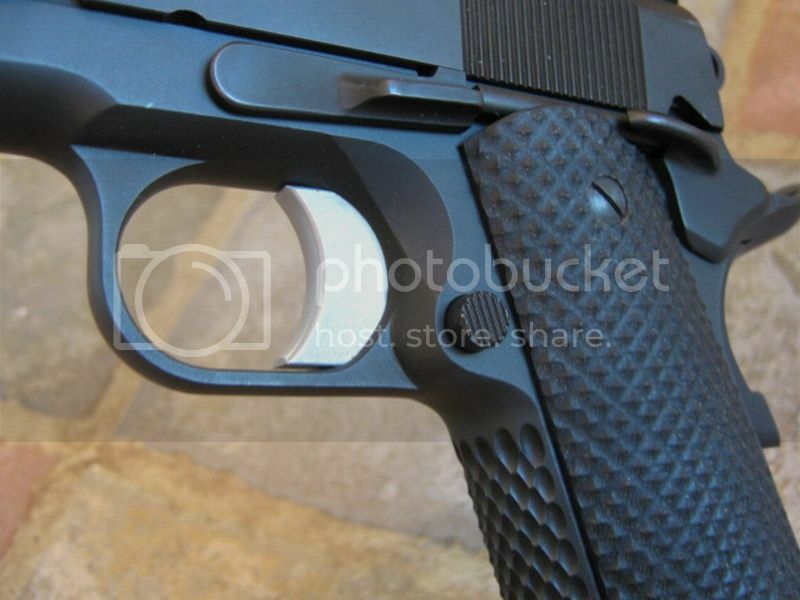 Most Novaks, Heinies and other 1911 front sights are .125 wide. Dave installed this sight for me to try, but future AFP models will have the wider .125" front sight, and will be blended into the slide. 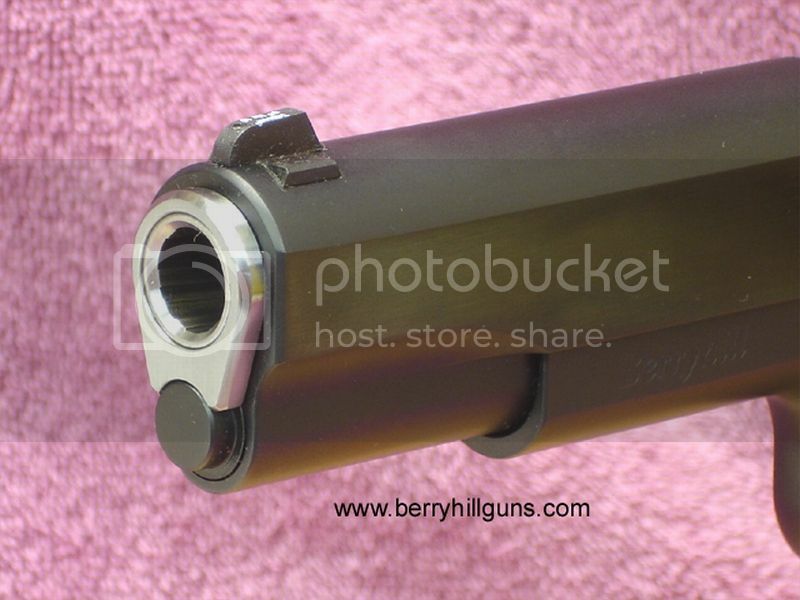 The recessed cut muzzle and barrel bushing are nicely blended together. And what do we have here? A small radius firing pin stop! 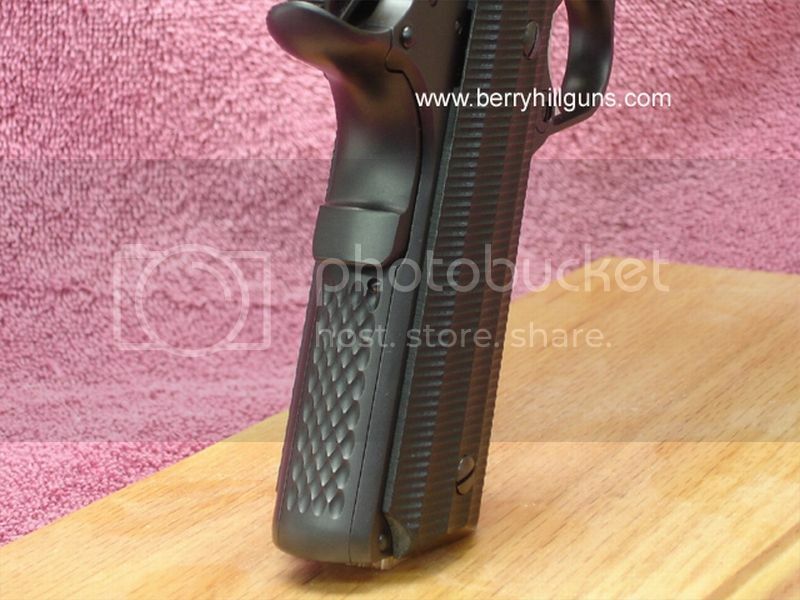 The slide to frame fit is second to none compared to other hand-built combat designated 1911’s. ‘Nary a rattle can be heard. 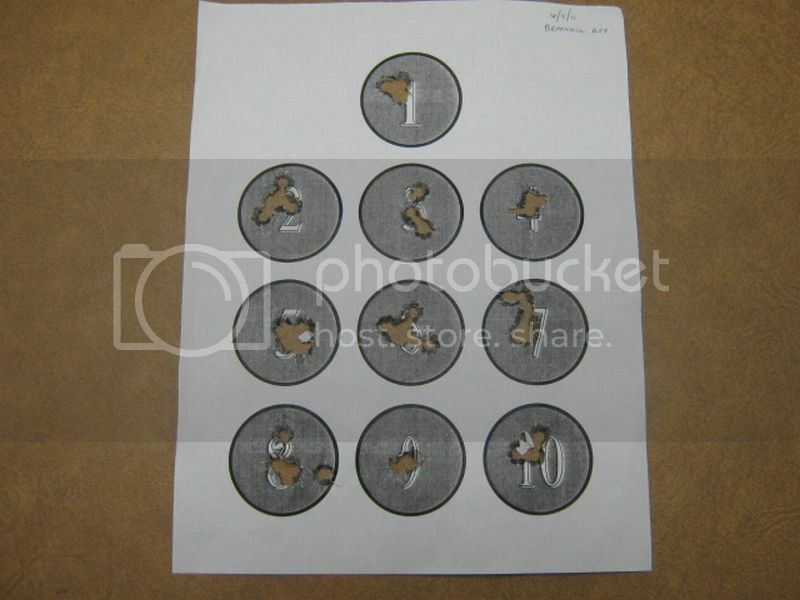 The AFP has a few rear sight options. This one has the 10-8 Performance .125" cut U notch rear sight. 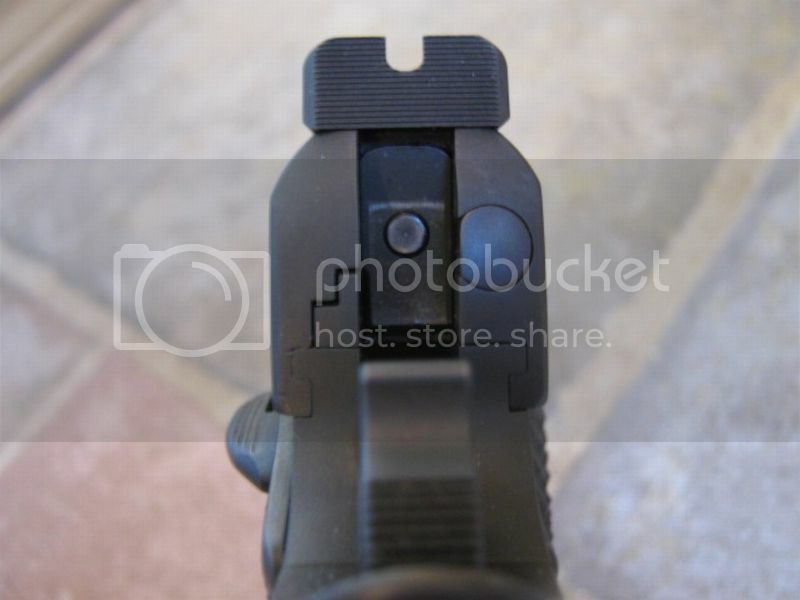 This rear sight option has a ledge to allow for one hand racking of the slide. 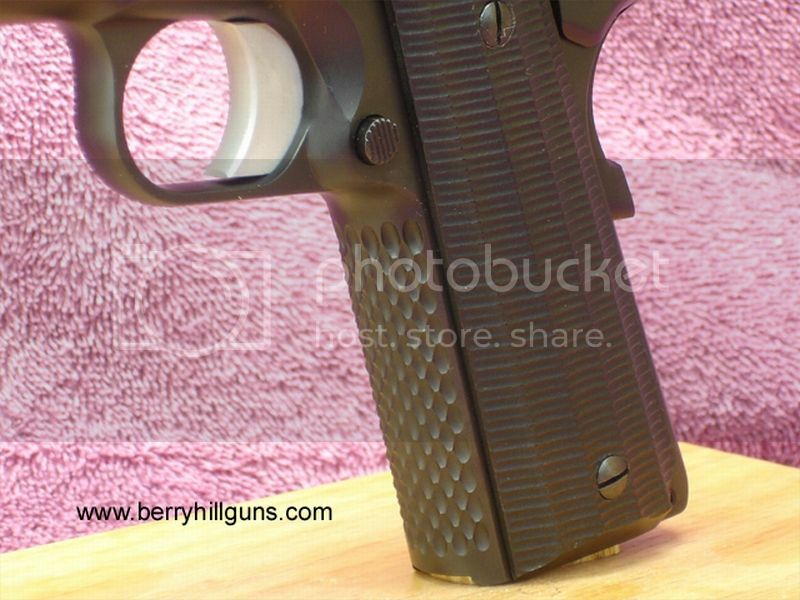 It has been said that a 1911 that has a tightened slide/frame fit will choke at the sight of dirt, but someone didn’t tell that to this model. I ran a total of five magazines through it before the class was finished. After class, a few others and myself stuck around and shot some steel for awhile. We ran another 20 magazines through it, hollow points included, without any hesitation to cycle. I’m not a betting man, but I would guess that most folks would never let or see their beloved pistol get in this condition. But it is comforting to know that a hand-fitted 1911 with no GI rattle will function as advertised. Now THERE’s a novel idea. The only way you’re going to get results like that is from consistency, not only from the shooter, but also from a properly fitted and timed barrel … and Dave really knows how to perform that function! If you’ve read my other gun testing articles this will sound like a broken record, but from CQB contact distance out to 20 yards, and distances of 5, 7, 10 & 15 yards in between, I fired seven different commonly found rounds, including some +P. I ran my usual gauntlet of various magazines; Wilson 47Ds, Wilson ETMs, and a ten-round. Stock Colt seven-round, Metalform seven- & ten-rounders, Metalform seven-rounders with the Wolff spring update, Metalform magazine bodies with Wilson’s eight-round conversions, old GI, and even some fake Colt gun show seven-round magazines. With the combination standard 16- and even a 14-pound recoil spring and a 23-pound main spring, along with the original style, small-radius firing pin stop, the gun recoils straight and true, allowing me to get consistent accuracy with fast follow-up shots and multiple-round strings. Even with +P ammunition, there was no felt torque in the hand, the gun tracked like it should, and really didn’t feel that much different in the hand. The trigger pull held consistent at 4¼ pounds, which is the lightest I recommend for a street gun. All the controls functioned as they should, very smooth, and the thumb safety went into its positions with an easy but positive “click” … even with much dirt in tow. I was able to run a good mixture of ammunition specimens through the pistol, most of which are currently available. Since I know many people carry a variety of currently available defense rounds, I try to include those in my testing. Ammunition used was: Remington’s Golden Saber, Federal's HST Regular and +P, Hydra-Shok, Speer’s Gold Dot, Winchester's SXT, Winchester’s white box ball (FMJ), and some Washougal River Cartridge Co. (WRCC), 230gr FMJ. Through the 500 rounds of various makes listed above, I never had one malfunction, or even a hesitation. Having been in a few scrapes on the street, needless to say I take my firearms and training pretty seriously … I don't pack just anything, I'm picky and very opinionated about such things. There has been a lot written by people who have only heard shots fired at a range, in a movie or on TV. When you talk to Dave Berryhill, you’re speaking to a guy who has been on the street, and who knows what it takes to come out on the other end. The AFP was designed to meet that demand. Dave’s dedication to harsh environment quality is something that is sorely lacking in gun makers these days. Look through the extensive list of specs and options, using Dave as a solid reference; you’ll be able set up the AFP to your mission specific needs with confidence. I have been packing this AFP for several months now, and can only find two things I would change. 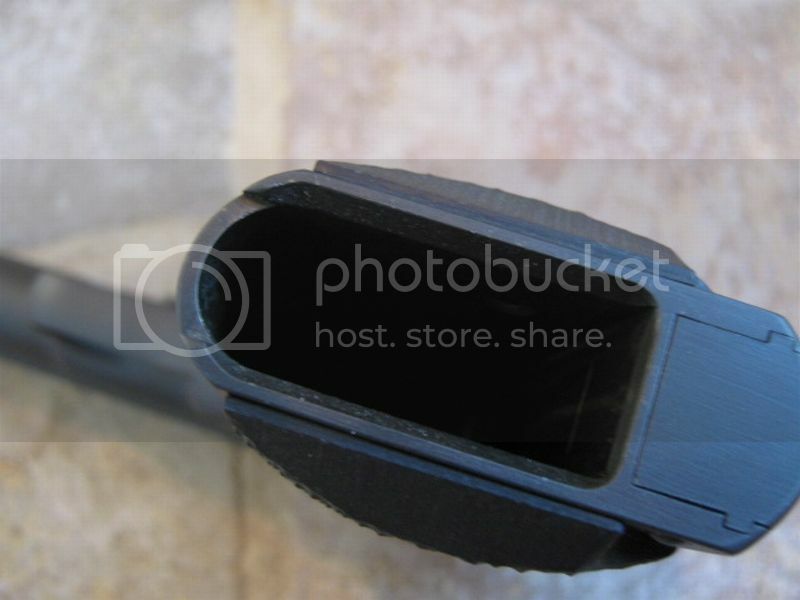 First, I would switch to an arched mainspring housing. I have fairly large paws, and the arched MSH takes up the space in my hand, which allows the gun to swiftly point more accurately for me. 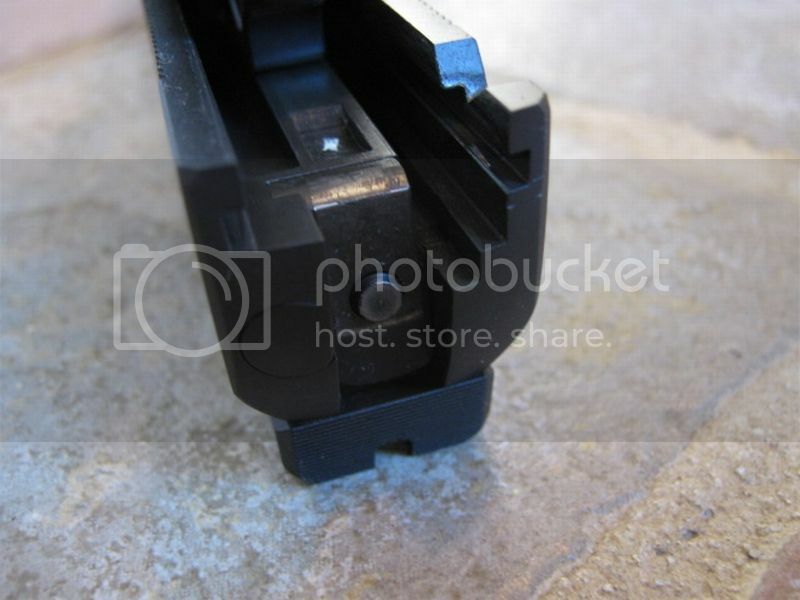 Second, a rear sight with a slightly wider notch would help my older eyes to pick up the front sight faster. The AFP probably won’t win any glamor awards, but then it wasn’t designed to. It’s made to function, field strip fast, and last like no other. With the AFP you get a totally handmade, custom 1911, with a price that’s close to some of the upper end production models. Next time you’re at the range, drop in the dirt and see if your current 1911 will stand up to the harsh environment life. If it doesn't, look no further than the AFP for a proven choice. I’d like to thank Dave for allowing me to thoroughly trash … uh … I mean give a custom pistol a solid workout! Here’s dirt in your eye! 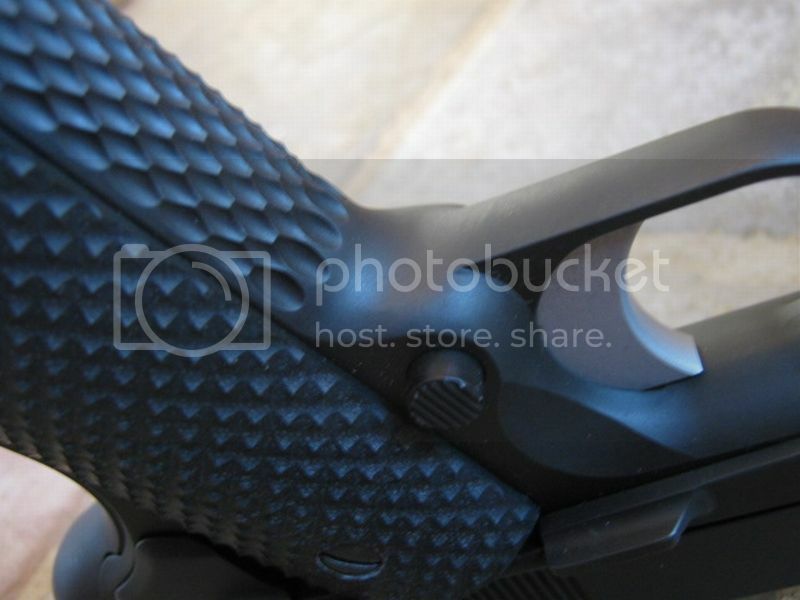 Please use this thread to discuss this pistol and this review in our Forums Site. Solid match trigger with permanent overtravel stop in your choice of length and texture. Bar stock extended thumb safety.